SAN FRANCISCO, Calif. /California Newswire/ — The Ian Ross Gallery in San Francisco is pleased to bring you its first two-person show for 2014. As a gallery committed to showing the work of local talents, we are very excited to be showing prolific San Francisco artist John Waguespack and introduce rising star Katja Tapia, both new to the Ian Ross Gallery. This joint exhibit brings together two talented forces that work in different styles and techniques. Taking from a variety of inspirations and subject matter, both Waguespack and Tapia have the ability to capture and captivate our senses through their bold color palettes. Waguespack and Tapia will exhibit their works at Ian Ross Gallery through March 15, 2014. What: Hard Candy: by John Waguespack & Katja Tapia. Where: Ian Ross Gallery, 466 Brannon St, San Francisco. Exhibition Dates: February 7 – March 15 , 2014. Opening Reception: Friday February 7 VIP Opening – Thursday February 13 Public Opening. "Hard Candy" is a creative collaboration of two local talents, John Waguespack and Katja Tapia. Working in vastly different styles and techniques, Hard Candy portrays the emotional connection, the process involved, and the result both artists have with their own works. "Some of the work actually feels like hard candy – the colors, the stripes, the texture, and the light making the work visually unexpected and bold," says Waguespack. A conversation about gender is suggested through Hard Candy, as the collection evokes a visual narrative of Waguespack and Tapia's friendship and their passion for creating art. 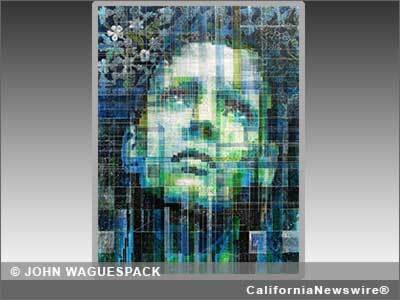 John Waguespack is a contemporary artist residing in San Francisco. Waguespack was honored as the inaugural Artist-in-Residence at the Fairmont San Francisco in July 2013. His work has been exhibited at Art Basel Miami in 2012 and 2013, The LA Art Show, and the San Francisco Fine Art Fair. Waguespack has had recent solo shows at The McLoughlin Gallery, 111 Minna Gallery and Heath Gallery. His artwork has recently adorned the covers of both San Francisco's 7×7 Magazine and the Nob Hill Gazette. For more information about John Waguespack, please visit http://www.johnwaguespack.com/ . Katja Francesca Tapia was born in San Francisco. She graduated with a BA in illustration and graphic design at Pratt Institute in Brooklyn, NY. She wanted to find a way to focus less on graphic art and more on the 'hands-on' painting process itself, she found herself exploring a new direction, abstract painting. Influenced by masters like Rothko, De Kooning, Kline, and Jackson Pollock, Katja has developed her own style of abstract painting. Her works evoke imagination and express emotion, through movement and texture. Her compositions stir the observer's creative point of view. She has a unique understanding of color that expresses her personal emotions and perspectives, yet invite the observer to come up with their own meaning. In 2013, Ian Ross opened the gallery doors to 500 guests including a television crew from the local news station. The two-story, 2,400 square foot gallery features 10,000 square feet of outdoor mural space that currently displays artists represented by the gallery, including Ian Ross. Located in the heart of SOMA, with a goal to support local artists, the gallery is surrounded by some of the most innovative companies in the world. The Ian Ross Gallery is a strong supporter of the community through the donation of the gallery space to local charities for fundraising events. These organizations include Save the Bay, Wine to Water, Youth Speaks, SF Beautiful and Keep Tahoe Blue. By forming a creative hub in a neighborhood already electrified with the energy of innovation and entrepreneurial spirit, the Ian Ross Gallery has become a collective of artists and entrepreneurs who are all part of something special: San Francisco.